The Take a Break from the Present video series will take you on an exciting journey at the discovery of ancient illuminated books. You will get to leaf through beautiful facsimiles from the comfort of your home, hopefully getting a sense of what it would be like to go through the original manuscript. Facsimile Finder is a company specializing in facsimile editions of illuminated manuscripts, sourcing the best editions at the best price. At its core are Giovanni and Giulia, who have made a name for themselves for their passionate, knowledgeable, and friendly approach both to publishers and customers. Giovanni and Giulia at work! Since they first started, the goal of Facsimile Finder has always been to bring a general interest to facsimiles (and original manuscripts, of course), not only for collection purposes but also for their significant value in the study of the world of antiques. Indeed, these valuable books play a major role in academic teaching and learning paths, and it is to this end that Giovanni and Giulia work constantly in order to provide the best service they possibly can. The team of Facsimile Finder works with facsimiles on a daily basis. Facsimiles arrive in the office ready to be shipped to their proud new owner, and everyday Giovanni happily takes care of the quality control so as to make sure that everything is in check and that the facsimile fulfills the requirements. To have the chance to handle and take a close look at such valuable and exquisite items is something that the people of Facsimile Finder never took for granted. So, over time and without realizing it, this daily routine and the enjoyment resulting from the unpacking and the going through of the books kick-started the idea to share this experience beyond the walls of Facsimile Finder by turning the simple act of leafing through a book into an opportunity for everyone to experience the beauty and the marvel of facsimiles. Since the initial idea, the project was then shaped and developed into what you can now freely access: a video gallery going by the name of Take a Break from the Present allowing anyone who wishes to to browse their favourite facsimile and watch it come alive! As you read, some of you are probably thinking of digital galleries as the best way of taking a close look at their favourite manuscripts, and you are right, digital galleries, too, play a very important role in this respect. However, they do lack a couple of features which became almost obvious when Giovanni started getting involved in academic talks and presentations in which he also showcased beautiful facsimiles. As a matter of fact, he noticed that the partaking students’ reaction to the replicas was of great surprise. 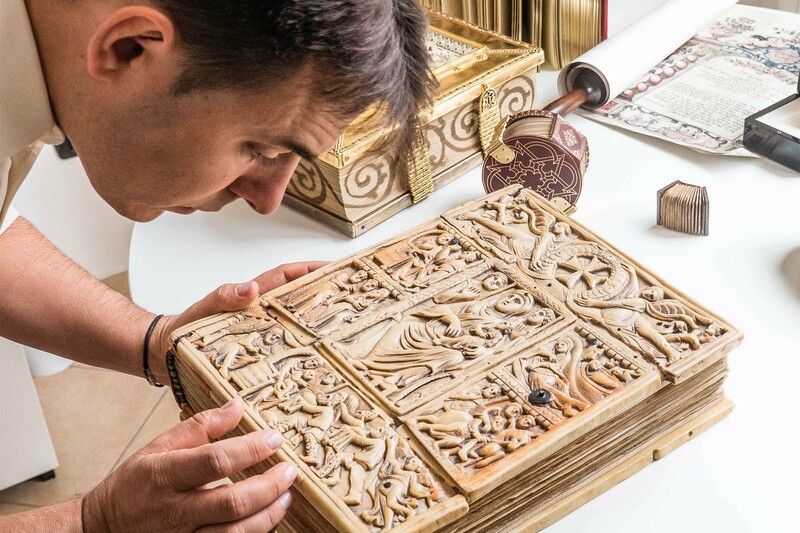 The main reason for this was the fact that facsimiles, much more than the digital galleries students are used to rely on, allow the beholder and handler to have an idea of the physicality of the object, ￼helping to get a sense of the original manuscript. Digitalization, albeit a groundbreaking progress, does create some confusion in terms of how we see things, distorting one’s perception due to the use of flat images. When looking at the screen, almost nobody pays attention to the true size of what they see, since it’s easy to forget that what is on screen is an actual three-dimensional item. This is one of the reasons facsimiles are so important and they should not be downplayed. Ultimately, the combination of both digital galleries and facsimiles is the most efficient way to experience the original manuscripts, when direct access is not possible. To cater for the lacking aspects of digital galleries, Facsimile Finder has come to the rescue with the creation of this project, which was also recently launched on Youtube. The Take a Break from the Present video series has more than 250 videos ready to be released, one per week, giving to all those interested the exciting opportunity to view the leafing through of facsimiles of lavishly illuminated medieval manuscripts and to appreciate the physicality of the object in its true size, all this from the comfort of your own desk. So, what are you waiting for? Take a break from the present and take the time to enjoy the past!